Top notch advisory team backing the management team. Revenue-sharing exchange or otherwise known as fee split allocation. Under the CEO's leadership, this project looks ready to execute and scale. Team is good but it seems you guys focus too much on technology and development rather than marketing and communication which is crucial to the success of the project. No marketing positions for a brand new exchanges among a lot is a big question to me. Vision: Not new as many coins/ tokens are using staking as a good way to motivate holders to not selling off or being loyal to the coin/token. Again, if marketing/ communication is not done right, you can't stop holders selling off. As you are sharing profits/ revenues to its holders so if the profits is good enough, they will not stay. To earn good profits, you need to PR your exchange and marketing/ communication is the key. Good product is not enough TBH. Can't comment on the product as it is not in demo stage. One of the issues that people have with the use of crypto currencies is the lack of transparencies in the generation of the currency. With Decoin, the very fact that open source software is being used in a big way not only ensures a better acceptability but would bring in the much needed trust factor with the activity. This could well point to the next generation of crypto currencies that not just enable the trade in them but also to keep funds parked in the currency. If ever there is a drawback, then it is the relative suspicion that crypto currencies are regarded with. A fair bit of effort is needed to establish a trust factor and this could well be the biggest stumbling block in the system. Project's looks interesting to me. Team is good, strong and experienced . Advisor board also good. MVP is not yet ready. The idea of an exchange is not new, but at the same time, we need more, more innovation and more options, as this will ensure that more tokens are listed. At the same time we need the security that companies will not run away with the money. Being regulated in Bulgaria is a good thing, as its part of the European Union, which we all know how strict things can get. Is not easy to run away with the money. As the MVP is not yet available, and because your whitepaper does not provide much info on technical inputs am force to provide a less rating.. but surely you can provide this info before I re-evaluate. Strong team and great vision for the project. Revenue sharing is a great way to keep people from selling off their ICO tokens. Profit-sharing trading platforms have been successful in the past, so I see no reason why this project would fail. Hard to comment on the product as it is not finished yet, but the team and concept are top notch. Looks very interesting to me. The field is super competitive and there are a lot of initiatives but nevertheless tackling those issues is worth it. The substance behind the project and team looks solid to me; given the high goal and the long journey I would label it as a high risk-high potential investment case. Don't know what other experts are reading, but I see bellow average quality in this project - they announce they will do it all (make their own blockchain, DEX, credit (!) card, etc.) yet there is nothing there to show they can deliver on any of it. Legally this is a security token (promise of revenue or is it profit share, they mention both in the introduction paragraph). They at least allocate a significant budget to legal/licensing, which will be required. A good team, with experience in the filed and with complementary knowledges is a good starting point. I don't think vision and product really stasfying, because it may be the umpteenth exchange. Some of them give benefits on trading fees, others give shares to Exchanges's coin holders. 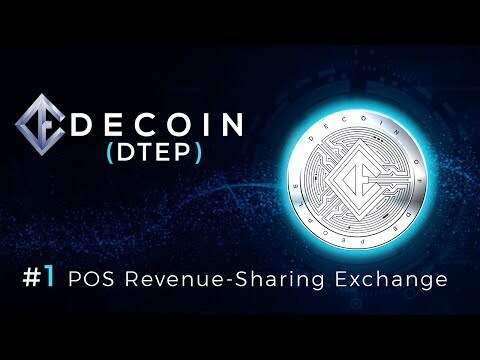 I really liked the DECOIN vision and the team behind it is very professional, I enjoyed the fact that I can liquify my profits from the exchange immediately with the D-TEP Credit card. And that you really show that you care and try to bring a solution for understanding and using blockchain assets right from the front line, especially for people who have zero knowledge in this fantastic field. Strong advisory bench, including start advisor Vladimir Nikitin.